I’m sure all readers will be shocked to hear me say that I give a resounding “yes” to the question. 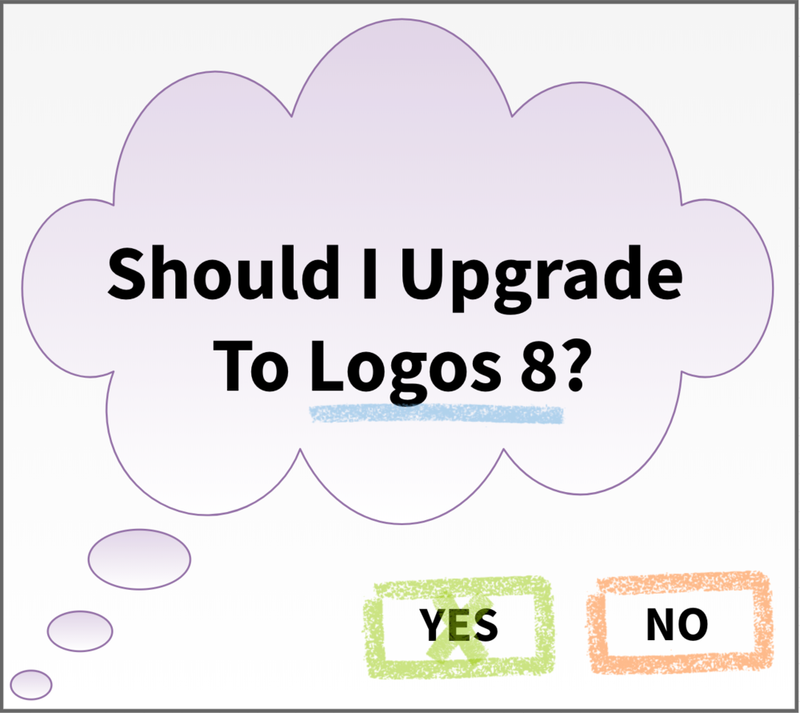 There are a number of stellar new features in Logos 8 that make it well worth the upgrade. And Logos has made it possible to upgrade the features of the application without having to necessarily upgrade your resource library. Do keep in mind, though, that the more quality sources you have in your library the more useful and powerful Logos and all of the application features become. So my recommendation is to at least upgrade to the Full Feature Upgrade. See this Logos blog post to explain all of your upgrade options. I want to in particular recommend the upgrade for those who might still be running version 6 of Logos. There was, in my mind, a very significant leap that began with version 6 to many outstanding datasets and features that are only available as Logos features (i.e. they are not standalone books or sources). You can see my review of Logos 7’s features in an earlier blog post, or see all of my Logos related posts here. Let’s face it, Logos has always been seen as a bit of a resource hog. In fact, this tends to be the number one complaint of my students (the second complaint of “I don’t know how to use it I address with my Logos video course). Given the power and utility of Logos, it is a sacrifice we users make. But Logos 8 brings some speed improvements in the app and a UI refresh. Included in the UI refresh is an improved way to sort through the menus and library, utilizing filters. The next speed improvement I hope Logos tackles is the amount of time the beast takes to index! My favorite new features is Workflows. Workflows move from the bare presentation of information (which the Guides do) to providing instruction AND a workspace for your research. Logos 8 comes with some stellar pre-built workflows for users, or users can create their own workflow and even share it with all Logos users. As a teacher I love this feature. Our seminary utilizes the Duvall & Hays Interpretive Journey approach, and I’m currently creating a Workflow for this to share. Workflows really does make it possible to go from passage right to the completion of a sermon (complete with slides and sermon notes, handouts, etc). To learn more about Workflows, see here. Part of the UI improvements includes an update to how Notes work. I really love the new features of Notes, including the filtering ability as well as the ability to see and utilize notes within each resource via the new menu button. For those who utilize Notes a lot in Logos, this will be welcome. My only complaint, which I’m confident will be rectified soon, is that some previous features of notes have been temporarily lost in Logos 8, but they will be returning soon (see this page for details of missing or deprecated features). This is probably my biggest complaint about Logos 8 – I would have rather waited a few more weeks so that I didn’t lose something like moving to the next annotation in my Locator bar, as it is something I use regularly. In version 7 (or perhaps it was features I received because of my FaithLife connect subscription) Logos had begun to do more concentrated work in the area of theology – things like the systematic theology explorer, and the new components of the Passage Guide like Biblical Theologies and Systematic Theologies. The new Theology Guide continues to build on this by utilizing the excellent Lexham Survey of Theology. Using the standard systematic categories and creating a variety of sub-sections within the categories, users can gain an overview and be presented with relevant scripture passages, relevant resources or sections of resources already owned, as well as important works outside of the Logos ecosystem. I was (pleasantly) surprised to see this new feature within Logos. On one hand it seems a little outside the scope of a Bible software to have quite a competent layout editor built in. I have done and continue to do some graphic design in the past with apps like Keynote and OmniGraffle. While OmniGraffle is very powerful and Keynote very easy, Canvas does a superb job at being both intuitive and powerful. And because the text is central, Canvas in fact exceeds the ability of other graphic design apps in working with and manipulating passages that a person inserts. The simple little image in this blog post was created in about 2 minutes with Canvas. To learn more about it, see here. But I Need Some Help Learning How to Use It ! Well, I got you covered! As many know, I created a Logos tutorial course to help people learn how to master Logos Bible Software to supercharge your Bible study. I’m happy to say that on the weekend I updated the course to accommodate users of Logos 8. So whether you are a brand new user of version 8, or you are still using version 5, 6, or 7 and need some help, my course covers them all. I’d love to have you join the course! Newer PostBiblical Greek Made Simple is Here!